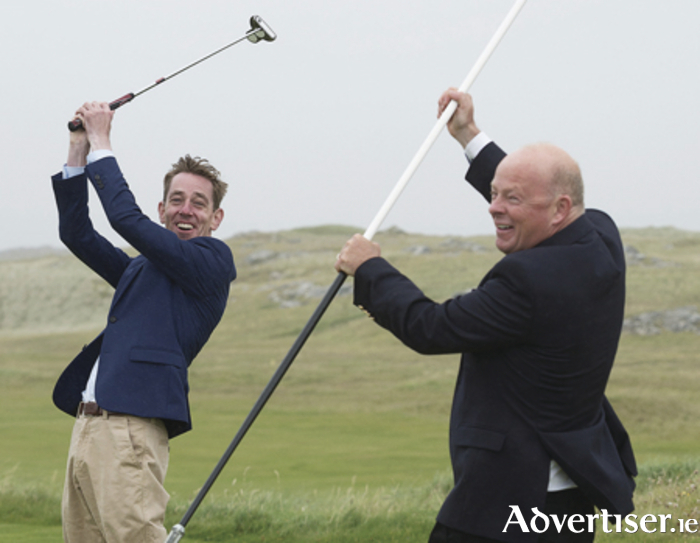 Television personality Ryan Tubridy has the craic at Connemara Golf Club in Ballyconneely, Co Galway, with club captain Brian Hughes of the Abbey Glen Hotel, after he was awarded honorary life membership of the club. Tubridy is "absolutely delighted" to receive honorary life membership of the famous championship links course, which has played host to many great golfers such as the great Tom Watson, Rory McIlroy and Shane Lowry, and says it is now his "late late effort to try to understand the world of golf". Brian Hughes described the presentation as the highlight of his captaincy. "To have the opportunity to honour my famous cousin in this way is a great privilege. In all the years I've know Ryan as a friend and as a cousin, his talents have been mostly nocturnal and I never knew him to be a sportsman as such. Perhaps Connemara will be the turning point of his career as an up-and-coming sportsman on the golf course." In 2001 Tubridy, who has been a regular visitor to the area, was the first person to be granted the freedom of Connemara, held in conjunction with the bicentenary celebrations of Clifden.